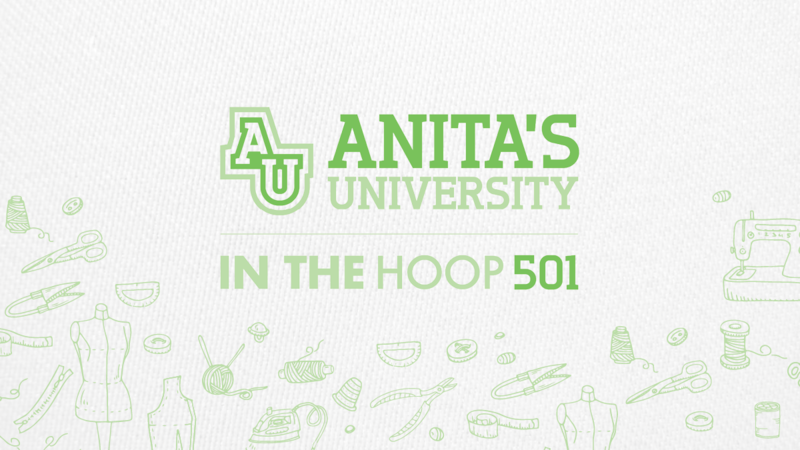 Anita Goodesign is thinking inside the hoop with the newest class in our university line up, 501:In the Hoop! In this class you will be learning all about our innovative in the hoop techniques. As the name suggests, all of the projects are made easily in your hoop and create unique, fun and useful projects. We'll cover a lot of different in the hoop projects like personalized tags, beautiful sun catchers, and decorative lace wreaths. You'll see how to make handy luggage tags, cardholders, keychain bags... and sew much more! You'll receive hands-on learning with one of our amazing educators. You'll see how to incorporate your machine to really take your projects to the next level. For attending you'll take home a 3-ring binder filled with tons of information, detailed tutorials, and our exclusive tips and tricks. All of this education will be supported by beautiful designs on your USB stick so that you can create these projects anytime you like! Make sure you're in the loop by signing up for 501:In the Hoop now! No previous machine embroidery experience required. We'll show you everything you need to know. Over 140+ designs on a USB stick to take home! Top grade educational tutorials printed in full color in a 3-ring binder - over 150 pages! Advanced knowledge of unique in the hoop projects & designs! An opportunity to win prizes, shop our products at great prices, and take advantage of dealer machine specials.